This easy Slow Cooker BBQ Chicken is made with a simple, homemade BBQ sauce (or swap out store bought! ), and is so tender! 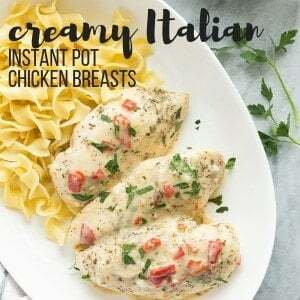 Make it with chicken breasts, thighs, bone in or boneless. Ever so slowly we are moving toward Spring, and sunshine, and picnics, and cookouts and camping season. Every year, I am equally as excited. But what do you do when it’s still early in Spring, and it’s warmish but not so warm that you want to spend every night outside grilling your dinner? You bust out the slow cooker and make this Slow Cooker BBQ Chicken. This crockpot BBQ Chicken is so easy and so versatile. You can use boneless, skinless chicken and make pulled chicken for sandwiches, salads or wraps. 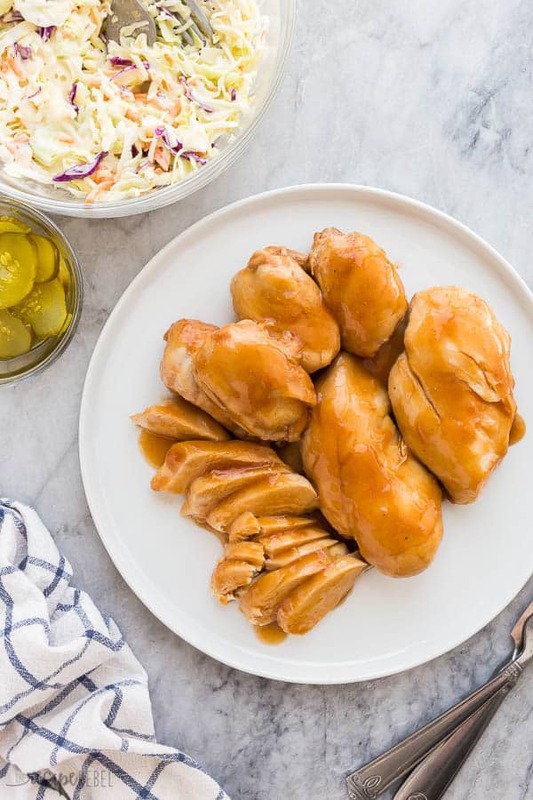 Or you can use bone-in thighs, drumsticks or wings and have yourself a tasty feast with a side of potato salad, all with minimal prep and maximum flavor. When I was dreaming up the perfect “Hey! It’s Spring! 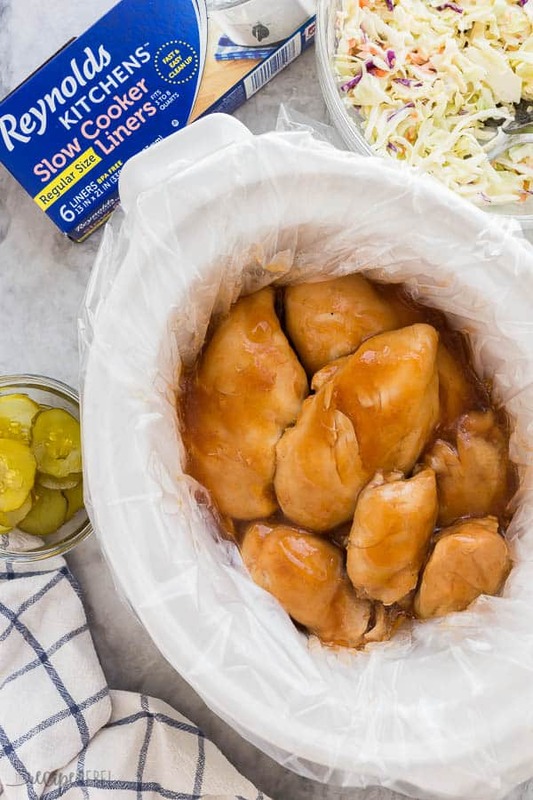 We want BBQ but don’t want to stand over the barbecue” meal, I figured it’s easy enough for anyone to throw some boneless chicken breasts in a slow cooker and cover with store bough BBQ sauce. I wanted to use my own Pineapple Brown Sugar BBQ sauce (it’s a reader favorite! ), because I figure if you’re really in a time crunch, it’s ridiculously easy for you to just swap out my incredibly delicious and homemade sauce for your favorite store bough variety. No reworking the recipe or wondering how it will turn out. It will turn out just fine. But if you want to do a little extra and start from scratch, this sauce on this Slow Cooker BBQ Chicken is a new favorite around here and I’m sure you’ll love it, too! 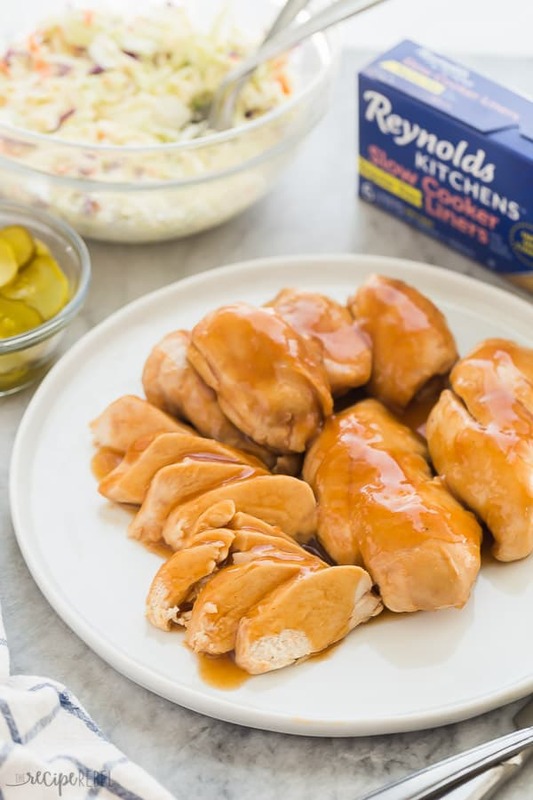 To keep this recipe so simple and weeknight dinner worthy, I throw in one of Reynolds Kitchens Slow Cooker Liners before tossing in my chicken and sauce, and that way the clean up is basically none at all. They’re made of heat-resistant nylon (no plastic!) and are BPA-free, so they’re 100% safe to cook in. Which is exactly how much clean up I like to do when the sun starts shining and the air starts to smell like living things again. I don’t know anyone who looks forward to scrubbing that beast of a slow cooker after enjoying whatever delicious thing it has been cooking all day, so Reynolds Kitchens Slow Cooker Liners are the way to go! Like I mentioned above, you can swap out my homemade BBQ sauce for your favorite store bought variety if you’re in a crunch. We all do it sometimes. No one here will judge! Throw in some extra veggies to make it a full meal deal, just be sure they’ll cook in about the same amount of time as the chicken, otherwise you’ll have mushy, unappetizing vegetables. Another option is to add more delicate vegetables just for the last hour or two of cooking. This sauce would be awesome over smoked sausages and peppers, a turkey breast, meatballs, meatloaf… you name it. Feel free to experiment a little with your protein once you’ve tried the recipe as it is! If you like your sauce a little less sweet with a little more heat, feel free to tweak the sauce to your tastes. Nothing in the sauce needs to be cooked before tasting, so feel free to adjust before you dump it on your chicken. Add some cayenne pepper or more red pepper flakes if you want to up the spice! What kind of chicken is best in this recipe? This recipe is incredibly versatile! You can use boneless or bone in chicken, just watch for the varying cook times. Regardless of what kind of chicken you’re using, I recommend removing the skin as it will only be soggy and unappetizing in the crockpot. When I bake chicken, I like to keep the skin at least until I’m done cooking because it makes the chicken so super moist. With the slow cooker, we don’t need to worry about that because it keeps in all of the steam as it cooks. 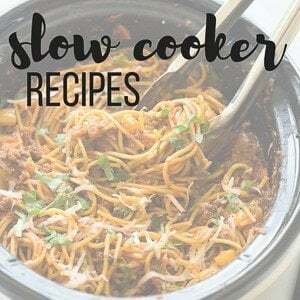 I have tested this recipe over and over (which is why this post is so long) and one important thing to note is that the fuller the slow cooker is, the slower it will cook and I’ve found this leads to the juiciest chicken (or you have to really reduce the cook time). Aim for filling the slow cooker about half to two thirds full. I tested this recipe with bone in chicken thighs and found that 6-7 hours on low is ideal for tender chicken thighs. Chicken drumsticks and wings can be slow cooked on low for 3-4 hours. Either remove the skin or you may want to crisp them under the broiler afterwards. 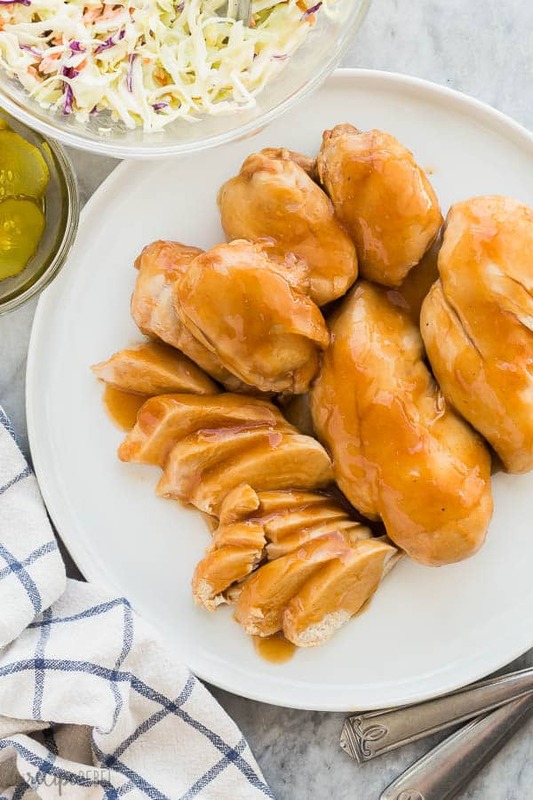 Boneless chicken breasts and thighs cook relatively quickly in the slow cooker, and are great if you are making BBQ pulled chicken because you don’t have to worry about removing the bones. Boneless chicken breasts can cook in 2-3 hours on low, depending on how hot your slow cooker is, but a full slow cooker will take a little longer to cook so allow up to 4 hours in this case. I’ve found that about 4-5 hours on low is perfect for boneless chicken thighs, so when I’m doing both together, I make sure the crockpot is at least half full and I usually cook for right around 4 hours and both are awesome. Make BBQ Chicken Pizza with pizza crust or mini naan breads for a quick lunch. Place in a large freezer bag (or several smaller bags for smaller portions), seal and squish as flat as possible. Freeze flat and keep frozen for 3-6 months. To thaw, simple leave at room temperature for 3-4 hours, in the refrigerator overnight, or place in a sink of cool water for 30 minutes. 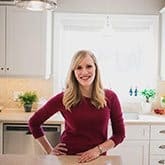 *This post is generously sponsored by Reynolds Kitchens and I was compensated for my time in creating this recipe. Thank you for supporting the brands that make The Recipe Rebel possible! In a medium bowl, whisk together juice, sugar, ketchup, Worcestershire sauce, garlic, onion powder, red pepper flakes and corn starch. Place Reynolds Kitchens Slow Cooker Liner in a 3-4 quart slow cooker. Season the chicken with salt and pepper and add to the slow cooker. Pour half of the sauce over the chicken, cover, and cook on low for 4-6 hours, or on high for 2.5-3 hours. Store remaining sauce in the refrigerator. Just before serving, heat remaining sauce in a medium saucepan on the stove top over medium heat until thickened. Serve with chicken as desired. (OPTIONAL: we like extra sauce but if you don't need it, you can save the refrigerated sauce for another use). 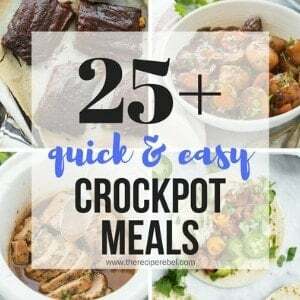 *The optimal cook time depends on a lot of factors: how full your slow cooker is (fuller = longer), what type of chicken you're using, and how hot your slow cooker is are just a few. I've given a range, but your best bet would be to keep an eye on it and check about 1 hour before the cook time is over for doneness. Thanks Olga! I’d love to hear how you like it!